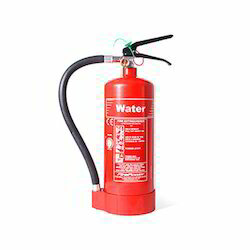 We are a leading supplier and trader of Water Type Fire Extinguisher. Our offered products are Fire Extinguisher, Hydrant System and Fire Sprinklers. Our in-depth knowledge and industrial expertise enable us to offer a distinguished range of Water Type Fire Extinguisher. Our provided fire extinguisher is widely demanded in offices, banks, shopping complexes, factories, etc. to protect goods from fire. This fire extinguisher is manufactured making use of premium quality raw material and sophisticated technology at our production unit. Apart from this, our patrons can purchase this fire extinguisher at industry leading prices.